Welcome to the new terminal at MBS International Airport. 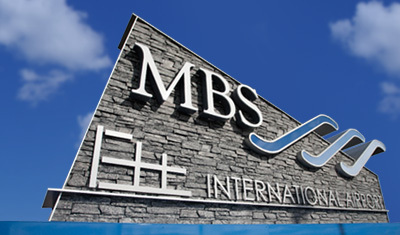 With the opening of our new 75,000-square-foot, state-of-the-art terminal, MBS is ready to reach new heights in service, comfort and convenience. 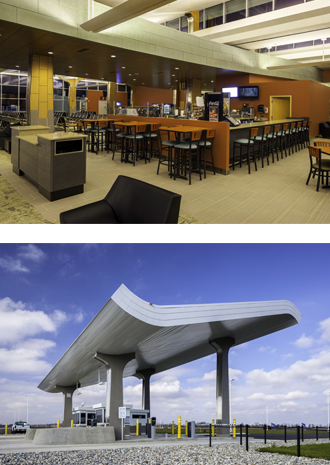 Designed by Reynolds, Smith and Hills Inc. of Jacksonville, Fla., the new steel-and-glass terminal maintains the ease and convenience that passengers appreciate about MBS International Airport, while incorporating a more modern, functional design that will make it easy to adapt and expand the airport to meet future needs. It also includes special touches that reflect the region’s heritage and innovative spirit. Upon arriving at the terminal, visitors will notice the distinctive wave-like suspended roofline, which resembles wings in flight. Once inside, a soaring, two-story lobby with glass walls allows in abundant natural light and connects visitors to their surroundings. Details such as MBS etched in Morse code in the glass walls of the passenger exit lane and other areas also demonstrate an attention to detail throughout the terminal. Read more about the terminal. We recognize that airports shape visitors’ first impressions of a region. The new terminal gives us the efficiency, convenience and image we need to enhance economic opportunities and quality of life in the Great Lakes Bay Region for decades to come. ©2016 MBS International Airport. All Rights Reserved.